The Global Volcanism Program has no activity reports for Karang. The Global Volcanism Program has no Weekly Reports available for Karang. The Global Volcanism Program has no Bulletin Reports available for Karang. Gunung Karang volcano in westernmost Java was constructed SE of the 15-km-wide Pleistocene Danau caldera. Two craters, Kawah Welirang and Kawah Haji, display fumarolic activity and are found on the eastern flanks, which may be of Holocene age (Bronto 1995, pers. comm.). The forested andesitic and basaltic volcano is the highest of a group of stratovolcanoes in the Danau caldera area and lies across a low saddle from Pulosari volcano. The Global Volcanism Program is not aware of any Holocene eruptions from Karang. If this volcano has had large eruptions (VEI >= 4) prior to 10,000 years ago, information might be found on the Karang page in the LaMEVE (Large Magnitude Explosive Volcanic Eruptions) database, a part of the Volcano Global Risk Identification and Analysis Project (VOGRIPA). There is no Deformation History data available for Karang. There is no Emissions History data available for Karang. 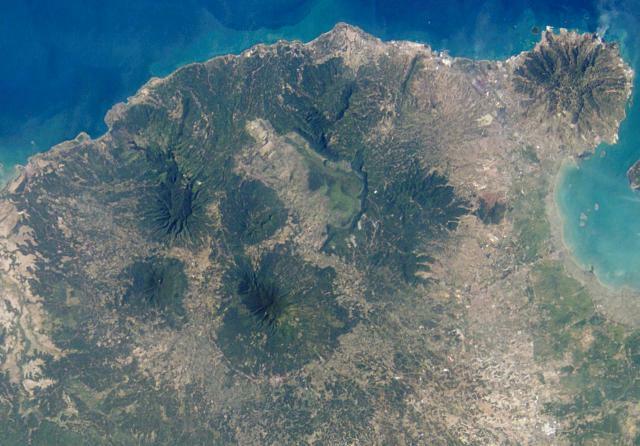 The large circular, forested volcano below and to the left of the center of this NASA Space Shuttle image (with north to the upper right) is Karang volcano. Karang was constructed to the SE of the 15-km-wide Pleistocene Danau caldera, whose northern and eastern rims and light-colored floor are seen above the center of the image. Two craters lie on the SE flank of 1778-m-high Karang volcano, the highest peak in this volcanic region at the western tip of Java. The Pujut Peninsula lies at the upper right. NASA Space Station image ISS004-E-10353, 2002 (http://eol.jsc.nasa.gov/). There are no samples for Karang in the Smithsonian's NMNH Department of Mineral Sciences Rock and Ore collection. Large Eruptions of Karang Information about large Quaternary eruptions (VEI >= 4) is cataloged in the Large Magnitude Explosive Volcanic Eruptions (LaMEVE) database of the Volcano Global Risk Identification and Analysis Project (VOGRIPA).